I'm just about to head to the airport after spending an enjoyable week in Raleigh, North Carolina at the Red Hat headquarters. Before I leave the week behind, I wanted to reflect a bit on what happened here. Earlier this winter, Greg DeKoenigsberg got in touch with Chris to see if we'd be willing to help him run a summer experience for professors wanting to teach and get involved in open source. We agreed, and spent the next few months putting together a one-week intensive bootcamp experience. We've done this before, but usually for students. 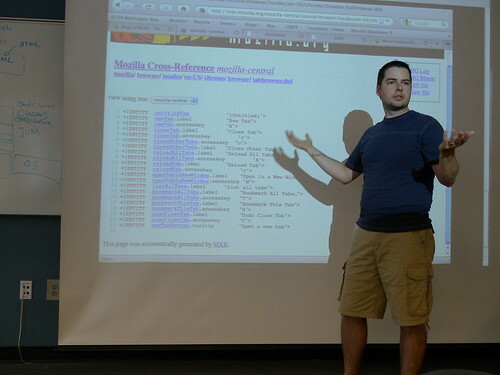 This was a different experience, because it was less about teaching the skills (all but one of the profs who attended teach Computer Science), and more about helping these profs think through what it means to integrate open source community and practice into the classroom. Our method was to use a series of case studies, in particular Mozilla and Fedora, and look at how we have engaged and worked within these communities with our students. We wanted to peel back the surface of two of the largest and most respected open source projects, and show that underneath it's really about a community of engaged and passionate people working together. Along the way we taught them how to communicate online, got them blogging, on planets, using irc and twitter; we showed them how bugzilla works, made patches, requested reviews, conducted reviews; we built Firefox, modified it, and learned how to work with the code; we packaged software for Fedora; we had hackfests until past midnight, discussed issues over dinners, and had a lot of fun getting lost in rental cars. Most of all, we shared ideas about how to help students succeed in the context of large open projects. I leave feeling very tired, but extremely satisfied. Greg collected an incredible group of profs, who brought tremendous energy to each of the five days. It's a lot to ask people to work all day (and night!) on things that are totally new, and remained engaged and full of ideas. These profs did it, and taught me a lot in the process. I'm grateful to Red Hat and Fedora for putting this on and doing such a great job of organizing everything--the good work they're doing here is already being noticed. I'm also thankful to Frank Hecker, who came for the latter part of the week to help me represent the Mozilla Education project. I think we inspired some talented folks to look seriously at working on and with Mozilla. And most of all I'm thankful for my colleague, Chris Tyler, who shared the load of preparing and presenting the material all week. Good work happens in community. I'm confident that what has begun this week will grow into real change in the academy going forward. The profs who leave here do so with an open invitation to engage with the open source community, the knowledge of how to get started, and some best practices and ideas for making it work at their own institutions. They have ideas for new courses, ways to integrate open source into existing material, thoughts on papers they want to write and journals they want to approach. The work we'll do together from this point will happen within the context of TeachingOpenSource.org, and I'd invite you to join the mailing list and irc channel, and read the planet so you can be part of it also. Open source should be on the radar of all students, and this is part of how we make sure that happens. "So when does home school end for the summer?"